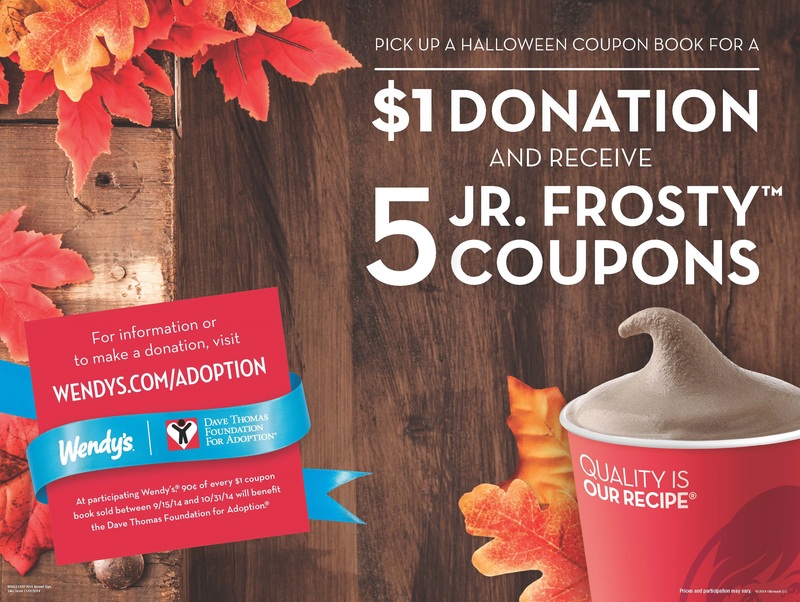 Wendy’s Halloween Frosty Coupon Book Now Available! My 4 year old is currently addicted to Wendy’s Chicken Nuggets and because she is currently eating as much as a bird, I indulge her more than I probably should. Yesterday I saw that the Wendy’s Halloween Frosty Coupon Books are now available, so I was sure to pick one up! This is the first year that Wendy’s is offering these coupon books at their restaurants nationwide. 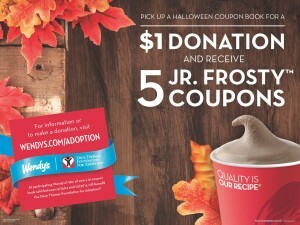 If you are new to these coupon books, here is how they work: For $1, you receive 5 or 10 Junior Frosty Coupons! These coupons can be used between 11/1/14 – 2/1/15. These coupon booklets are available for purchase through 10/31/14 or while supplies last. This is a great deal on it’s own, but I love that $0.90 of every $1 supports the Dave Thomas Foundation for Adoption. These make great little gifts for your kids, grandkids, nieces and nephews or neighbors! The Dave Thomas Foundation for Adoption is a national nonprofit public charity dedicated to dramatically increasing the adoptions of the more than 134,000 children waiting in North America’s foster care systems. Created by Wendy’s founder Dave Thomas, who was adopted, the Foundation implements evidence-based, results-driven national signature programs, foster care adoption awareness initiatives and research-based advocacy efforts. To learn more, visit davethomasfoundation.org, or call 1-800-ASK-DTFA. I live in the Columbus, OH market. Please note that coupon booklet prices and contents may vary by market. Some coupon booklets contain 5 frosty coupons and some contain 10. See your local Wendy’s location for info about the coupon booklet being offered in your area.